Use our easy design tool or free design service to plan your space. EasyClosets partnered with Laurie March from DIYNetwork.com to bring you the best organizing tips and makeovers! If you're lucky enough to have a big walk-in closet, you're snoozing next to a great opportunity. With the proper space planning, a large master closet will not only organize your clothes, but it can also allow you to forego bulky bedroom furniture elsewhere. While a roomy walk-in is a luxury, it can be easy to misplace the smaller stuff within all of that space. 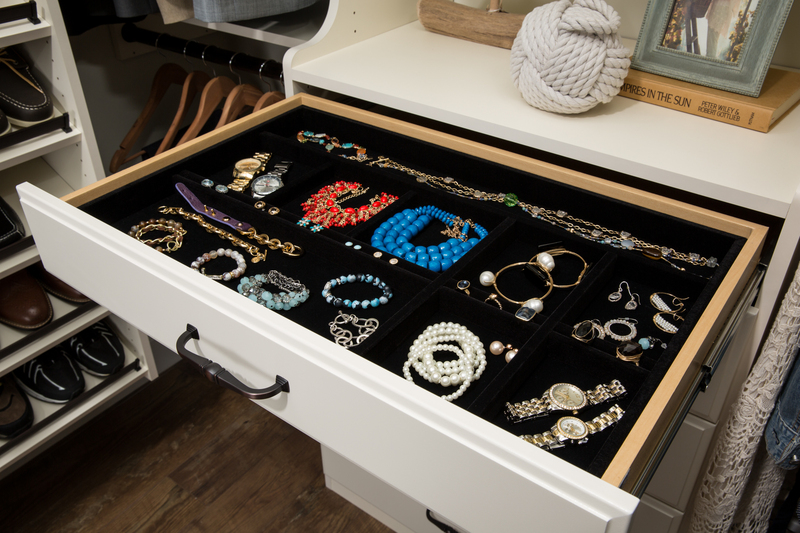 Dedicated jewelry drawers ensure that your most treasured accessories are safe and sound. Especially when you're sharing a closet, it's important to designate certain spaces for specific items. Your partner can't help you to keep things organized if you don't let them in on your systems. Clear communication is an important part of closet cohabitation. And now it's time to get real - as in, are you really going to hang up all of your t-shirts every time you put away your laundry? While some of you might, I'd suggest some open shelving and/or wire baskets for your foldable items. 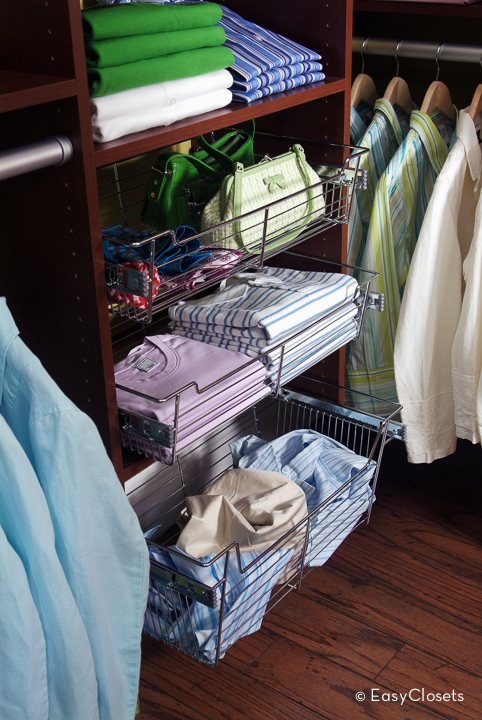 It's faster to put things away, and yet, you can still see your clothes when you're dressing. Clothing you see more often is clothing you wear more often, so these options offer you both ease of use and visibility. So is your walk-in closet living up to its full potential? My guess is there is always room for improvement. Let me know about some of your biggest closet's challenges, and let's whip those walk-ins into shape! Use our easy design tool or free design service to plan your space..